Jostling for position in Zanu PF has heightened in Mashonaland West amid reports sitting Zvimba South MP Walter Chidhakwa and his main rival have turned funeral wakes in the constituency their battleground to campaign as both parties try to outdo each other in rendering support to bereaved families. The contest for Zvimba South constituency has already begun where Mines and Mining Development minister, Walter Chidhakwa is facing an acid test to retain his parliamentary seat from Chrispen Saidi, a former provincial political commissar. Saidi is popularly known as Kadoza. Both incumbent legislator and the aspirant are reportedly involved in different philanthropic activities to lure prospective voters to their camps, but political pundits predict the sitting MP could fall by the way side in primary elections expected early 2018. Saidi, who is a former Banket's Ward 22 councillor, and is seen as the major threat capable of jettisoning Chidhakwa from the August House. Chidhakwa, a relative of Mugabe, stands accused of neglecting his constituency. Saidi confirmed his interest in running for the seat. "I am gunning for the seat because Chidhakwa has had two terms in Parliament but has nothing to show for it. There is no meaningful development in the constituency, therefore it is high time he passes on the baton to someone capable to steer development," said Saidi. Saidi said he was aware of shenanigans being employed to thwart his bid for the Zvimba South legislative seat. A member of the Constituency Development Committee, who preferred anonymity, told this publication that Saidi is posing the biggest threat to Chidhakwa as he enjoys the support and loyalty of most district chairmen and war veterans. "It is possible for Saidi to hand Chidhakwa a defeat in the primaries. The minister knows it and he has been running around of late in the constituency to win the hearts of the people who no longer trust him. 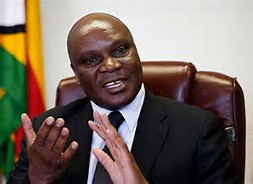 Chidhakwa is returning to start projects four years after his election but this will not fool the electorate," said the source. The acrimony between Chidhakwa and Saidi recently played out in public when the Mines minister allegedly instigated Saidi's overthrow as proprietor of a lucrative country sports club in a bid to financially cripple him. Chidakwa's close associate only identified as Makuyana now operates the facility. Saidi was leasing the club from the Lands ministry. He also said his farm was under threat of expropriation and redistribution. Efforts to get comment from Chidhakwa were fruitless at the time of writing.